I’m not comfortable giving out my email address freely on the internet, but many websites require a valid email address when registering. While this is typically harmless, it does open you up to the potential for spam – and who wants that? TrashMail lets you sneak past compulsory email registration by generating a disposable email address and using it to forward messages to your actual email account. This semi-fake account can be set to expire after a certain period of time, or even after a specific amount of messages have been received. TrashMail allows you to register anywhere (while still receiving initial registration/validation emails) – but once your disposable address has expired, you won’t receive any more messages! TrashMail.net: TrashMail can be used in any operating system by visiting TrashMail.net. You can create your disposable address name (a random name will be generated automatically), and specify your real email address. Below that, you can choose how many emails you want to receive and how long the disposable address will last. 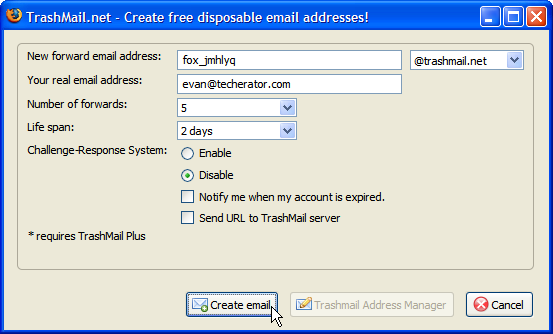 TrashMail in Firefox: If you use Firefox, using TrashMail is even easier. To get started, install the TrashMail add-on and after a browser restart the service will be integrated in your browser. 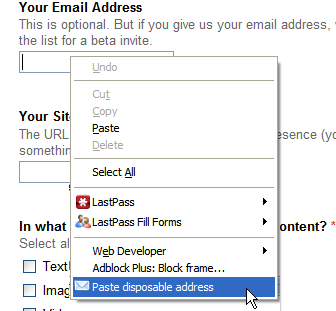 The next time you’re required to enter your email address, right click the field and select Paste disposable address. A new window will open that lets you customize your disposable address, your real address, and choose the number of emails and life span of the disposable account (just like on the website). Once you click ‘Create email’, your disposable address will be immediately inserted into the form. A few limitations: With the free version of TrashMail, your disposable email accounts can only receive a maximum of 10 emails and can only last one month. These restrictions can be removed if you purchase TrashMail Plus for $3.99/year, but the free version has been more than sufficient for my usage. TrashMail is a great way to keep your inbox free of spam, and is incredibly simple to use with the Firefox add-on. Just remember to only use a disposable email address on non-essential websites, in case you need to log in or receive emails in the future.